ASOUND - SV231DVIUA SV231DVIUA Startech - 2 Port Dvi Usb Kvm Switch With Audio And Usb 2.0 Hub - 2 Port. New Retail Factory Sealed With Full Manufacture Warranty. ASOUND - SV231DD2DUA SV231DD2DUA Startech 2 Port Dual Dvi USB KVM Switch With Audio & USB Hub. New Retail Factory Sealed With Full Manufacturer Warranty. 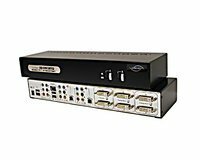 ASOUND - SV231DPDDUA SV231DPDDUA Startech-2 Port Dual Displayport USB KVM Switch W Audio & USB HUB-KVM Audio Switch-2 Ports-Desktop. New Retail Factory Sealed With Full Manufacture Warranty. ASOUND - SV231TDVIUA SV231TDVIUA Startech - 2 Port Triple Monitor Dvi Usb Kvm Switch With Audio & Usb 2.0 Hub-2 Port Rack-Mountable. New Retail Factory Sealed With Full Manufacture Warranty. ASOUND - SV231QDVIUA SV231QDVIUA Startech-2 Port Quad Monitor Dual-Link DVI USB KVM Switch With Audio & HUB-2 X 1-8 X DVI-D (Dual Link) Digital Video. New Retail Factory Sealed With Full Manufacture Warranty. ASOUND - RACKCONS17HD RACKCONS17HD Startech-1U 17 HD 1080p Rackmount Lcd Console With Front USB HUB-1 Computer(S)-17 LCD-1920 X 1080-2 X PS 2 Port-4 X USB-1 X DVI-1 X VGA. New Retail Factory Sealed With Full Manufacture Warranty.